YES! I do respond to every email, every day, in the year 2019. I always get a couple snake skin emails each day, and it's fun for me to inspect and identify them. Go ahead and send me a pic of the skin you found! 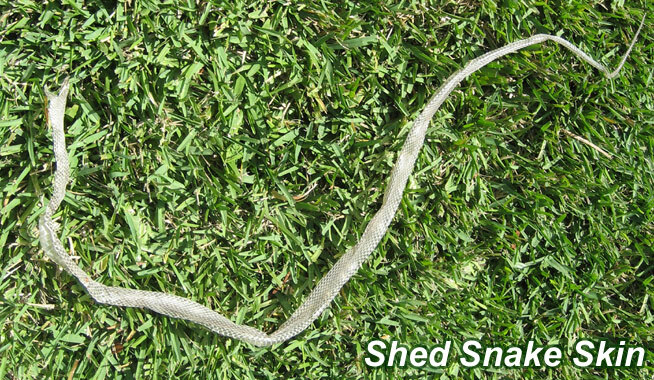 How can you tell what type of snake left behind a shed snake skin? Snake skin ID is very difficult for non-experts. I have found that most non-herpetologists have difficulty identifying a complete snake upon seeing it. But just the skin, it's even harder to identify what kind of snake shed a particular skin. That's why I'm willing to do it for you, for free. Just email me some photographs of the skin, or even USPS mail me the shed snake skin you have found, and I will identify it for you, and email or call you back to tell you what type of snake it was. It's my hobby! The way an expert identifies a particular species of snake by examining the skin is of course to look at the scale pattern - each snake has a particular pattern of scales, particularly on the head, that is kind of like a fingerprint for that species of snake. Other factors, especially size, diameter, and body scale patterns, also help in the identification. Location can also help, as some species are similar from state to state or even city to city. Be sure to tell me where you live. In some cases, the patterns from one snake to the next are very similar, making exact identification difficult. It's a heck of a lot easier to tell when you see a whole snake, with its color pattern intact! As you've no doubt noticed, a shed snake skin has no color - like shed human skin, it's just a thin, clearish, pale white. It almost never has much of a trace of pattern left in it. At the very least, it's easy to identify the sheddings of venomous snakes - they are relatively rare in the US, and their body types are more distinct, their scale patterns more recognizable. As it is, it seems to me that more people see live snakes than they do find shed snake skins on their property or in their yard or house. People send me photos of snakes all the time for me to identify. But not that many people send me a photo of a snake skin. But as stated, if you want to email me some shed snake skins to ID, or even mail me the skin, I will happily identify the snake for you for free. What if you find a shed snake skin or two in your attic? I've actually seen this a few times in my career, and had customers with this exact case. Every time, it's a species of rat snake, such as the Yellow Rat Snake or the Black Rat Snake, that has climbed into your attic because it smelled rats or mice living up there, and now it has a decent place to live and get food. In that case, snakes can live up there for a while, and thus leave behind shed snake skins. You may want to read my How to Identify a Snake page for other identification tips. Shed snake skin evaluations to determine if a shed snakeskin is from a venomous North American snake. 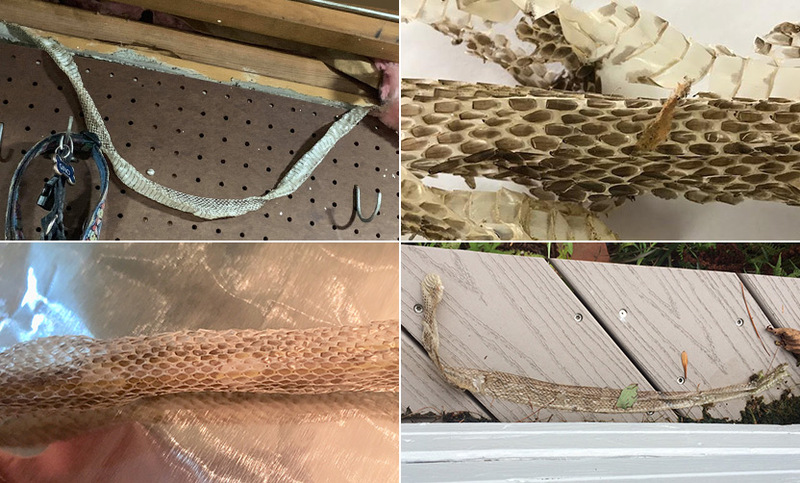 The pattern, type and configurations of scales of shed snake skins are as unique and distinctive as finger prints are from humans. If you have found an intact/complete shed snake skin and wish to know if it is from a venomous snake, then please use the following steps to get the skin to us for an evaluation. Step 1: Place shed skin in a zip-lock or plastic bag. Step 2: On a 3 x 5 card, please include the following; your name, your mailing address, telephone area code and both home and work telephone numbers and where the shed skin was found. Place this information in the bag containing the shed snake skin. Step 3: Include payment with shipment. Use the US Post Office to ship to our PO Box. Cost of service is just $25.00 for the first skin and $10.00 for every additional skin included in the shipment. For all checks and money orders, please make payable to Snake Removal, Inc. ®™. VISA and MASTERCARD payment information should include your name as it appears on the card, card number and expiration date. If you have a dead snake, but no shed skin and have access to a photocopy machine, place the snake on the glass plate (belly side down). Send copy to our home office using the same procedure outlined above for the shipment of shed snake skin. The cost is the same as a shed snake skin evaluation. If you can make a copy of a dorsal view (back of the snake) then that would be very helpful too. Please ship only intact shed skins or clean copies of snakes. Upon the receipt of your package, we will perform our evaluation to determine if the shed snake skin is from a venomous North American snake. If the skin is from a venomous North American snake, then you will be called alerting you as to the specific nature of our findings. You will also receive a written statement of our findings as well. All non-venomous North American snake results will be mailed out to you. Note: Do NOT ship snake bodies, carcasses or live snakes in the mail! Strolling into a copy store with a snake, is behavior we strongly discourage, as it may not be in your best interest. Okay, that's what the old site owner wrote. But if you want a much easier shed snake skin ID resource, for Florida FL, Texas TX, Pennsylvania PA, North Carolina NC, California CA, Virginia VA, Georgia GA, or any state in the US, just email me directly, and I'll do my best. I think I'm one of the best snakeskin identifyers out there. Any old dry snake skin with a pattern or without, in a house, basement, yard, attic, or anywhere. It could be from a black snake, a striped snake, or any number of patterns. Often the skins are just off-white, but I can often make out the pattern. Just take a pic with your smartphone and forward it to me via email, and I'll tell you if it's a venomous snake or poisonous snake like a rattlesnake or a copperhead or a harmless snake like a garter snake or water snake, and the precise identity of the species or the general group of species if it could be one of a few different types. Can you tell a snake by its skin? For non-experts, it is difficult, but I usually can. Do venomous snakes shed their skin? Yes, all snakes do! What time of year do snakes shed their skin? Year-round, 2-4 times per year, depending on their level of growth. The shedding of skins is called Ecdysis. Some people send me photos of complete skins, often inside-out, and some people send me pictures of pieces of skin, and that's okay too. I often need just a small segment if I can see scale or color patterns and general diameter. And don't forget to tell me where you live, that helps me too!